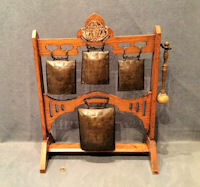 Original, quality circa 1900, dinner gong with four blacksmith made wrought iron clucket bells mounted on a honey coloured oak frame with an oak shafted beater on a hook to the side. 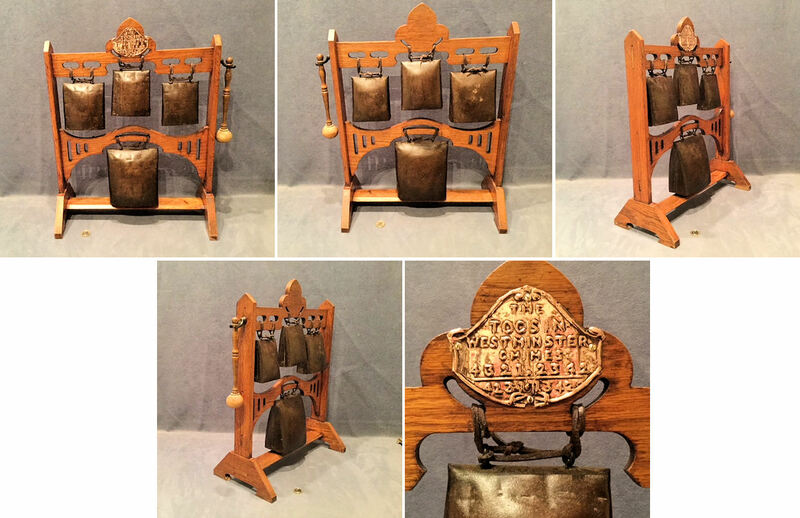 Each bell is suspended with leather thongs and are stamped numbers 1 to 4. The top pediment of the stand has an embossed copper plaque detailing the instructions to ring out the "Togsin Westminster Chimes", 4321, 2342, 4231 and 1342; providing you follow these directions it really does play the Westminster Chimes tune. All has been cleaned and waxed and is complete and in good and working order. 20.5" tall, 15.75" widest and 7.75" front to back at base. 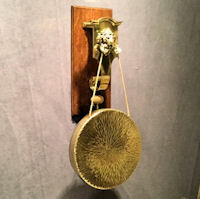 Original, quality superb cast brass on oak wall mounted dinner gong manufactured by William Tonks and Son of Birmingham with a lion's head on a scrolled brass mount, all mounted on a rectangular shaped honey coloured light oak backboard with a hook for the brass shafted beater beneath. 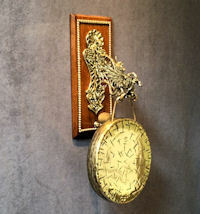 The circular brass gong is suspended from the lion's jaws and has a textured finish. The backboard has a brass wall hanging plate to the reverse and this and the oak backboard is impressed with the sun logo and "WT&S" for the manufacturer 'William Tonks & Son of Birmingham'. The backboard is also stamped with the registration number for the year 1912. The brass has been polished and lacquered, although the lacquer may be removed at no extra cost and all is complete and in good and working order with a super deep tone and resonance. The backboard has a slight warp but is in good order otherwise. Total drop 27", gong 12" x 1.75" as in picture, backboard 16.75" x 7.5" and beater 10" x 2". 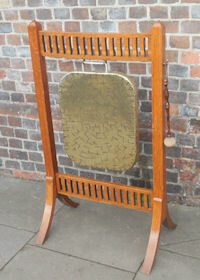 Original, quality late 19th century, superb cast brass on oak, wall mounted dinner gong. This exceptional example, manufactured by William Tonks and Son of Birmingham, must have been one their most detailed dinner gongs of all for the cast brass bracket is primarily a mythical horse with wings and a dragon's tail supporting the mount to hold the gong fashioned as two serpents and the back mount has a mythical bird or reptile head. All is mounted on the original honey coloured oak rectangular backboard with a forked hook to the lower edge to hold the beater. 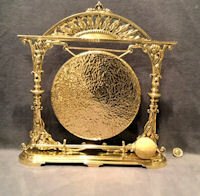 The circular brass gong has a textured finish and a logo "Burmese" and the backboard has a brass wall hanging plate marked "WT&S" with the sun logo. All has been polished and lacquered, although the lacquer may be removed at no extra cost and is complete and in good and working order with a good tone and resonance. 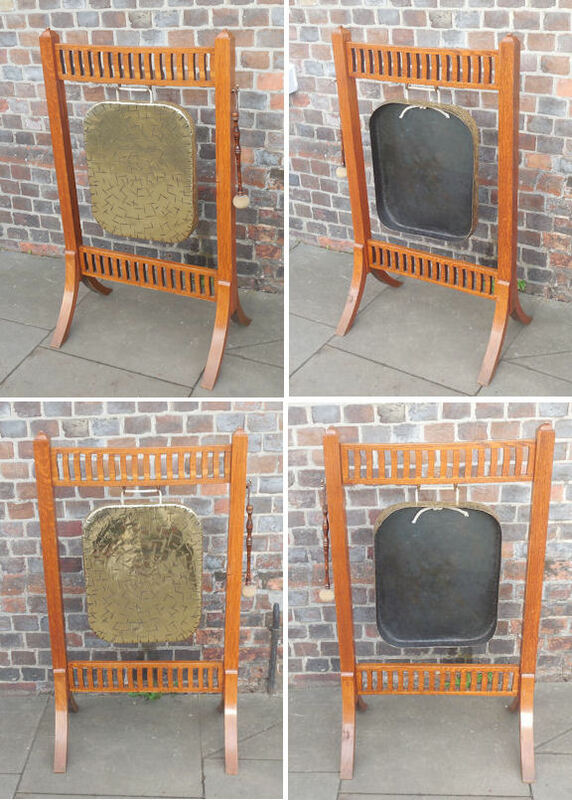 Backboard 15" x 7", gong 10" x 1.5", total drop 23" and hammer 9.5" x 1.75". Original, quality late 19th century circular brass dinner gong suspended within a super cast brass frame with a 'rising sun' of acanthus leaves top mount and acanthus leaf covered columns. The rectangular shaped base has two supports for the replacement gong beater made to suit, and the gong has a textured finish. All has been polished and lacquered, although the lacquer may be removed at no extra cost and is complete and in good and working order with a good tone and resonance. 14" tall x 14" widest, plinth 13.5" x 3.5" and gong 8.25" x 1.5". Original, quality late 19th century rectangular shaped brass dinner gong suspended in the original honey coloured oak floor standing frame. This frame is most unusual with a pierced fretted design to the cross rails above and below the gong. The gong is also not the normal circular shape and is stamped to the front with the trade mark 'Burmese', all is English though. The old beater included is of a similar age to the stand and gong. All is complete and in good and working order with a good tone and resonance. Gong 14.5" x 18" x 2.5", beater 11.5" x 2", frame 43" x 25" and 16" front to back at floor. Original, quality late 19th century circular brass dinner gong suspended within a cast brass frame, with horse hoof feet and a shaped plinth. A replacement hammer has been made to suit and is displayed on two hooks to the front. All has been polished and lacquered, although the lacquer may be removed at no extra cost and is complete and in good and working order, with a good tone and resonance. 15.5" tall x 11.5", gong 7" x 1" and 4" front to back. 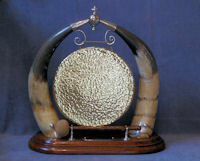 Original, quality large late 19th century, table dinner gong, with a pair of polished cow horns forming an arch, with a circular brass gong suspended between. All is mounted on a honey coloured oval oak plinth, with the hammer on stands to the front. The mounts are in nickel, with an oval plaque beneath the hammer for engraving if desired. The brass and nickel has all been polished and lacquered, although the lacquer may be removed at no extra cost and all is complete and in good and working order. A super looking gong with a great tone and resonance. 16" total tall and plinth 15" x 7.5".